It was the defending Caribbean champions pitted against the defending South American champions to kick-start Group B, and there wasn’t much in the contest at all. The Uruguayans were expected to run out comfortable winners, but Jamaica produced a commendable and spirited performance at the Estadio Regional Calvo y Bascuñán in Antofagasta. Here is my assessment of how the game panned out, what improvements need to be made and a look ahead to Tuesday night’s crunch fixture against Paraguay. The hard work in training on shape and structure certainly paid off as head coach Winfried Schäfer has made this Jamaican team much more of an organised unit. Lining up in a 4-4-1-1 formation, Jamaica restricted two-time World Cup champions Uruguay to very few clear-cut chances and that’s testament to every player’s work rate. Forward duo Darren Mattocks and Giles Barnes pressed intently from the front and the midfield quartet of captain Rodolph Austin, Jobi McAnuff, Garath McCleary and Simon Dawkins played an equally important role in containing Uruguay. McCleary and Dawkins carried out their defensive duties impressively – preventing the Uruguayan full-backs from overlapping – so the play was forced inside where Austin and McAnuff could screen. When Uruguay did get the ball into one of their strikers, Jamaica remained resolute in defence, with 22-year-old central defender Michael Hector putting in a particularly strong 90 minutes on his debut. There was very limited space for Uruguay to work with and that was down to the Reggae Boyz’s organisation and awareness, every player in a yellow jersey knew what they had to do. Both teams shared the same amount of shots (11) with Uruguay only managing five attempts in the first half, four of which were off target and the other blocked. Uruguay’s talisman Edison Cavani was virtually a spectator having made the least amount of touches out of any starting player on the pitch (25). In fact, Jamaican substitute Laing Laing actually saw more of the ball and he didn’t come on until the 53rd minute. Cavani’s inability to affect the game should be attributed to the solidity of Hector and Wes Morgan; the central defensive pair will still feel disappointed that they couldn’t secure a clean sheet. The Jamaican players should be proud of the energy, passion and drive that they showed, they kept on battling and battling until the very end. To lose out by a single goal to the most successful country in Copa América history – Uruguay have 15 titles to their name – is no mean feat. Such was the impressive nature of the Boyz performance, they even had some Chilean supporters cheering them off the pitch at half-time. They’re not merely here to make up the numbers. They’re here to compete. In terms of areas for improvement, Jamaica will have to work on taking their chances when they get them. The margins are so fine in these kind of major tournaments and capitalizing on goal-scoring situations can be the difference between advancing and not advancing. In the latter stage of the first half, Mattocks was picked out beautifully by Dawkins and bearing down on goal, he panicked and scuffed his shot. A bit more composure and confidence in that situation and Mattocks would have invariably hit the net. Barnes had several efforts, too, including one glancing header which skewed wide of the post. Substitute Deshorn Brown also saw his close-range header miss the target. Indeed, Jamaica generated 11 shots yet none were on target: seven wide and four blocked. In his pre-match press conference, Schäfer had talked about his team’s threat from set-pieces with Austin, Dawkins and Kemar Lawrence capable of striking from distance. However, delivery from set-pieces was of poor quality and therefore Jamaica failed to utilise the height of Hector and Morgan. Lawrence came closest from a long-range free-kick in the last five minutes but the opposition goalkeeper Fernando Muslera tipped it over. Lawrence illustrated his free-kick ability in a friendly against Canada last year and that type of quality is needed once more. It was especially frustrating watching the last 15 minutes or so when instead of building momentum and putting Uruguay on the back foot, Jamaica kept on fouling and the referee Jose Argote was all too happy to blow up. Uruguay, admittedly, were clever in the way they managed the final few minutes but shoving and nudging gives their players a reason to go down. Morgan, Hector, McCleary, Austin and Mattocks were all guilty of committing three or more fouls as Jamaica racked up a total of 19 compared to Uruguay’s 14. Granted, the referee didn’t let much flow but the Boyz must jockey and stand up, that way they’ll retrieve the ball quicker and can mount pressure on the opposing goal. Finally, it was a slight surprise that Schäfer decided against using all three substitutes. Maybe Dino Williams or Allan Ottey could have exploited spaces with their speed late on? Credit to the ‘Copa America 2015’ YouTube channel. Duwayne Kerr – The tallest player at the Copa América, the 6 ft 5 in goalkeeper commanded his area well and claimed the ball five times throughout the match. He couldn’t do anything about the goal. Adrian Mariappa – A natural central defender, he had a solid game at right-back and was willing to get forward as well as track back and close down Uruguay’s left winger Cristian Rodríguez. 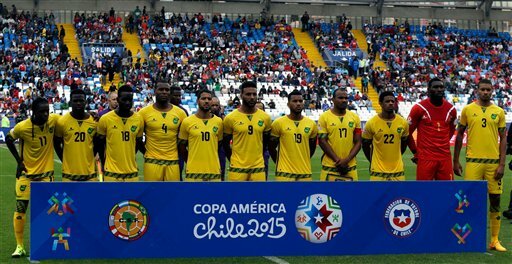 Michael Hector – Made his official Reggae Boyz debut and looked right at home. He had Cavani in his back pocket near enough all game, and was unfairly penalised for foul that led to Uruguay’s goal. On replay it is clear that he won the ball. Wes Morgan – Leader of the back-line and worked well with Hector. Now one of the first names on the team-sheet. Kemar Lawrence – Showed glimpses of his promise. Made some superb blocks in the first half, accumulating three interceptions and six clearances during the 90 minutes. Produced six crosses, too, illustrating his threat from out wide. Rodolph Austin – A typical warrior-like display in central midfield. A few needless fouls here and there but broke up play and made the most passes out of his teammates (66). Jobi McAnuff – Filled in admirably for Je-Vaughn Watson, who joined the squad on Sunday. Worked tirelessly and went on one terrific run late in the first half. Garath McCleary – Looked dangerous in the early exchanges but faded as the game wore on. Was asked to help out Mariappa with defensive work, less emphasis on getting at his man. Simon Dawkins – Tucked in to help out Lawrence on the left hand side and occasionally contributed in an attacking sense before being brought off eight minutes after the restart. Giles Barnes – Made his international debut in March earlier this year and has fitted in seamlessly. Constantly worked the channels, harried defenders and could have got a couple of goals. Darren Mattocks – Underlined his importance to the team by doing a respectable job of playing the lone striker role. Drew fouls in key areas around the box and proved useful in the air, winning the same amount of aerial duels as his marker Diego Godín (3). Really should have buried his chance on 39 minutes. Subs: Lance Laing – Threw himself into the action and produced some tantalizing crosses. Deshorn Brown – Steered his header wide to squander a solid chance. Tuesday night’s meeting with 2011 runners-up Paraguay should be very interesting indeed. The Paraguayans salvaged a point against Lionel Messi-inspired Argentina in Group B’s late kick-off on Saturday, so they’ll be high on confidence. If Jamaica apply themselves like they did on the weekend, but just fine-tune certain areas of their game, then they stand a very real chance of taking three points. A reminder that the top two from each three groups proceed to the knockout phase while the best two third-place sides join them. Paraguay, ironically, reached the final four years ago without winning a single game. Ultimately, Uruguay and Argentina are expected to occupy the top two spots so it’s likely to be between Jamaica and Paraguay for that precious third position. Schäfer’s men absolutely have enough in their locker to progress from this group – they simply need to turn that belief and hunger into a victory.